Bhubaneswar: With a view to learn about the Startup Odisha ecosystem and Smart City Initiatives undertaken by Govt. of Odisha and explore the possibilities of cooperation, a 12-Member European Delegation headed by Ms. Tania Friederichs, First Counsellor and Head of Research & Innovation, European Union along with Mr. Alain Ghislain Baetens, First Secretary, Belgium, Ms. Anna Maria Linnea Lunander, Counsellor, Innvation and Science, Sweden, Ms. Inger Midtkandal, Science & Technology, Counsellor, Norway, Mrs. Hanne Melgaard, Deputy Chief of Mission, Minister-Counsellor, Norway, Dr. Srinivas Kaveri, Director, CNRS office in India, France, Dr. Indraneel Ghose, Senior Thematic Advisor for Education, Research and Innovation, India, Mr. Andrzej Stuczynski, Third Secretary, Economic Section, Poland, Mr. Sune Kaur-Pedersen, Counsellor, Innovation and Research/Deputy Head of Innovation Centre Denmark, Denmark, Ms Hilda Viola Farkas, Counsellor for Science & Technology, Hungary, Mr. Massimo Spadoni, Scientific Attache, Italy and Dr. Vivek Dham, Advisor, Research & Innovation, visited the MSME Department to interact with the ACS, MSME Shri L.N. 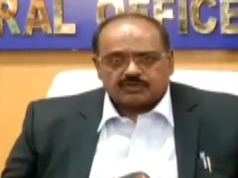 Gupta, VC, BDA Dr. Krishan Kumar and other stakeholders. 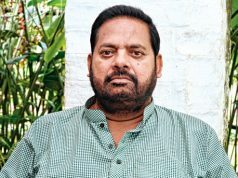 Shri L.N. Gupta, Additional Chief Secretary, MSME presented details of the Startup Odisha Initiative and appraised the delegation about the salient features of Odisha Startup Policy, Startup Portal and benefits offered to Startups. 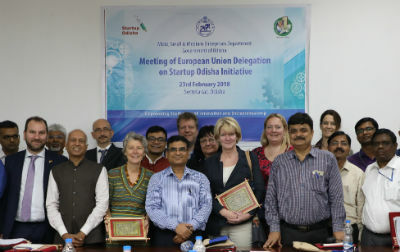 Appreciating the highest benefits offered to the startups under the Startup Odisha Initiative and recognition to 175 startups during a short period of last 10 months, Ms. Tania Friederichs, Head of the EU Delegation, proposed to extend network benefits from EU and work out collaboration in the area of innovation and entrepreneurship. Dr. Krishan Kumar, Vice Chairman, BDA made a detailed presentation on the Smart City Initiatives. The members of the delegation showed their interest in electric vehicles, energy efficiency, urban transport and renewable energy components and applauded the various initiatives of the state government under the Smart City Project. Summarising the interaction of the meeting, Ms. Tania Friederichs, First Counsellor and Head of Research & Innovation, European Union stated that they would like to carry forward the dialogue in terms of workshops and meetings and would like to form a concrete plan of collaboration. 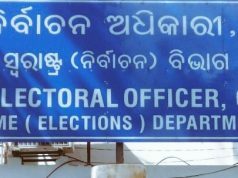 The EU members offered to share their best practices and experiences with Government of Odisha.